your clothes or other belongings, clean them thoroughly and without harmful chemicals, and then return them straight to your door. 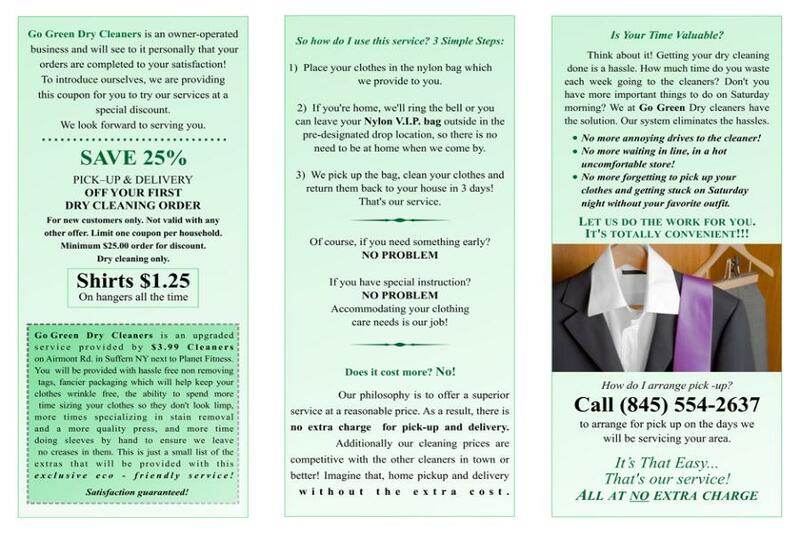 If you're ready to take the next step towards a simpler life, call Go Green Dry Cleaners Pickup and Delivery Service today. So how does our residential delivery service work? us the items, if you're not, we can set up a specific drop location. You don't have to be at home! We'll take your belongings, clean them, and have them back to you in 3 days. That's all there is to it! So how does our corporate delivery service work? We provide each employee with a go green bag with a unique identification tag. Simply place clothes in the assigned designated location we provide. twice a week on scheduled days. detailing anything else which may need special attention. in the past so you can hear what type of service and work we provide. No account is too small or too big just try us out!